Our group's primary research interests lie in the fields of biogeochemistry, chemical oceanography, and paleoceanography. Our work is interdisciplinary; we study the interactions between the hydrosphere, lithosphere, atmosphere and biosphere as well as the human impacts on these interactions. Specific current projects include Ocean acidification effects on coral reefs in Yucatan, Mexico; Subterranean groundwater discharge and its impact on costal ecosystems and climate; Phosphorus and nitrogen cycling in the environment; Impacts of atmospheric deposition on ocean ecosystems; and, Changes in ocean chemistry and productivity in the geological past. 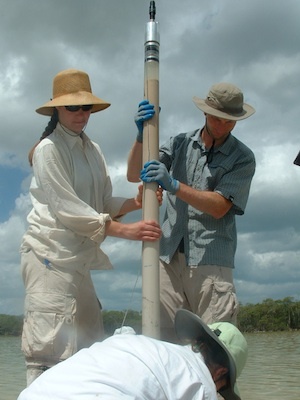 Joe and Nadine collecting sediment cores in the Yucatan Peninsula. Biogeochemical Cycles is the study of chemical and biological processes, often which are intrinsically coupled, operating within earth systems. Biogeochemical interactions occur on a wide-range of spatial and temporal scales, ranging from atomic and microbial to global and from the distant past to the present, and operate within environments ranging from terrestrial to marine to atmospheric. We focus on the biogeochemical cycles of elements that are important for life on land (soils, lakes and rivers) and in the ocean (C, P, N, Fe) and those that are related to changes in tectonics, ocean circulation, and provenance (S, Sr, Ca, Nd, Pb). Chemical Oceanography is the study of everything about the chemistry of the ocean based on the distribution and dynamics of elements, isotopes, atoms and molecules. This ranges from fundamental physical, thermodynamic and kinetic chemistry to interactions of ocean chemistry with biological, geological and physical processes. In our lab we are focus on the carbonate system (ocean acidification), inputs of nutrients and pollutants at the land sea interface from groundwater and surface water and impacts of atmospheric deposition on ocean chemistry and biology. Paleoceanography is the study of the history of the oceans in the geologic past with regard to ocean circulation, chemistry, biology, geology and patterns of sedimentation. Paleoceanography data are derived from many proxies found in deep sea sediments including trace metal and isotopic composition recorded in fossils, marine barite and sediment lithology. We use deep sea sediments and cores from lakes to reconstruct past climate conditions on Earth on time scales of centuries to millions of years.